Protect the bark of young shade trees, ornamental trees and shrubs this fall and winter from deer and rabbits. We recommend using trunk guards on your trees to keep deer from rubbing on the trunk. 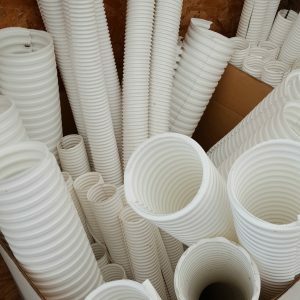 The white plastic trunk protectors are inexpensive, easy to install and reusable for several years, and will also protect tree bark from damage by mice, rabbits and winter sun. You can use tree wrap to keep rabbits from eating your tree as well. Make sure to protect newly planted shrubs and trees that are still tender to the rabbits and deer. Fence in the plants if possible. 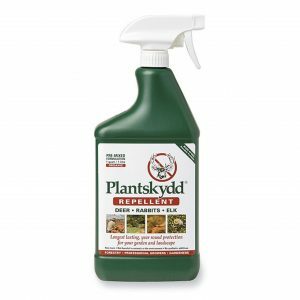 There are great spray repellants to use year round to keep the critters from snacking on your plants. 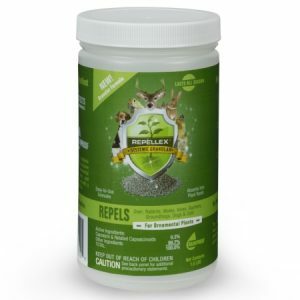 This spring remember to get the systemic granular repellent into the garden as soon as your see leaves coming out and planting emerging from the ground! DeWitt Tree Wrap protects trees from scorching, and from trimmer and mower damage. 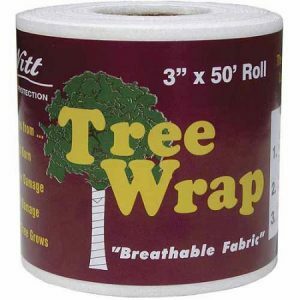 Tree Wrap is made of polypropylene fabric and easily conforms to fit any tree shape or bark texture. Tree Wrap slowly photodegrades to prevent girdling of the tree’s trunk. Young trees are at risk of sun and animal-related trunk injury during the winter, so be sure to apply tree guards as part of your yearly process for preparing trees for winter. 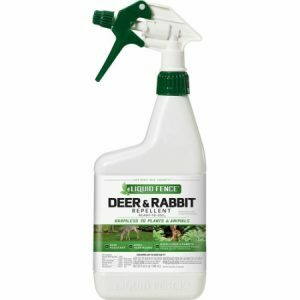 Scent deters deer and rabbits from lawns and flower beds. Rain resistant formula that can be applied year-round. Covers up to 500 sq. ft.
• PROVEN by independent research to out-last and out-perform all other repellents—up to 6 months over-winter! • EFFECTIVE against: deer, rabbits, voles, elk, moose, chipmunks, squirrels, nutria, opossum, and mountain beaver. • RAIN-RESISTANT—no need to re-apply after every rainfall. • SAFE for use in vegetable gardens, on fruit trees and food crops. • ORGANIC—first animal repellent OMRI Listed by the Organic Materials Review Institute for food production. It delivers a hot pepper concentrate through plant roots at the molecular level, making the plants inedible to animals. Because the active compound is protected inside the plant cells, it doesn’t washoff in the rain or degrade in sunlight. One treatment typically lasts the entire growing season. This entry was posted in chores, fall, gardening, Tree Care. Bookmark the permalink.